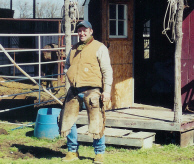 At the expense of sounding hokey or cliché – I grew up dreaming of being a cowboy... As far back as I can remember all I wanted to be was a cowboy/horseman. My grandpa was my hero, a cowboy when he was young. Through his influence horses became my life. I lost my hero when I was 9 and that pushed me to try and learn as much as I could about horses and the cowboy life. I learned to start colts the old fashioned way – hang on tight and hope for the best. Of course it didn’t take long to realize there had to be a something better. Around 21 I discovered Craig Cameron and from there Tom/Bill Dorrance, Ray Hunt, Buck Brannaman and others of that type. This true horsemanship was just what I had been searching for. Today I am still on that path – always trying to learn and hear what the horse is saying. I begin to start colts/train for the public at around 22 and continue to do so as time permits. 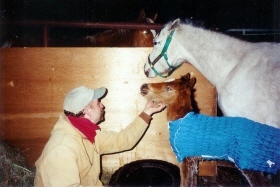 Over the years I worked all types of horses from Belgians, mustangs, foxtrotters and even the occasional mule. I’ve enjoyed this immensely. God has allowed me to cowboy for various ranches from Arkansas to Kansas to where I am now in Oklahoma. I truly believe horses have so much to offer us on so many levels. Ray Hunt is right when he said –You’re not working on the horse, you’re working on yourself. It’s realizations like this that help you further on your journey to know the equine. You become humble from working with the horse and knowing that that a bond of trust is there. A bond so strong yet so fragile.